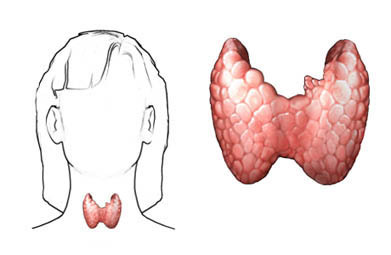 The thyroid gland is a butterfly-shaped gland in the front of the neck. Hypothyroidism is a condition in which the thyroid gland does not produce enough thyroid hormones. A healthy thyroid produces the hormones thyroxine (T4) and triiodothyronine (T3), which control metabolism. This affects how many calories you burn, how warm you feel, how much you weigh, and how the body handles functions of the cardiovascular, gastrointestinal, and nervous systems. Hypothyroidism results in a slower metabolism and a slower heartbeat. Hashimoto thyroiditis occurs when the immune system produces antibodies that attack cells of the thyroid gland. This results in thyroid swelling. Other less common causes include hypothyroidism as a result of radiation therapy to the neck for lymphoma, treatment of hyperthyroidism with medication or surgery, and treatment of thyroid cancer with medication, radiation therapy, or surgery. Subacute thyroiditis —Inflammation of the thyroid gland after a viral upper respiratory tract infection. Drugs —Drugs used to treat hyperthyroidism, lithium (used to treat certain psychiatric disorders), certain cardiac medications (such as amiodarone), and other medications (such as interleukins and alpha interferon). Medical treatments —Treatments that include medications, radiation therapy, or surgical removal of part of the thyroid gland (called subtotal thyroidectomy) to treat other thyroid diseases. Idiopathic thyroid atrophy —The thyroid tissue shrivels up for unknown reasons. Iodine deficiency —The thyroid gland does not get enough iodine to produce thyroid hormone (this is rare in the United States). Iodine excess —Certain foods (such as shellfish) and certain medications (such as cough medication) containing large amounts of iodine, which can block thyroid hormone production (rare). Infiltrative illnesses —Cancers and certain infections. Pituitary adenoma —A benign tumor of the pituitary gland that can cause a problem signaling the thyroid to make thyroid hormones. Postpartum thyroiditis —This condition usually improves but may be long lasting. Congenital hypothyroidism —An infant that is born with problems making normal amounts of thyroid hormones. About 5% of Americans have hypothyroidism. This condition usually occurs in adults. However in some cases, children or infants may have hypothyroidism (called cretinism). Children need treatment as quickly as possible or intellectual disability may result. What are the risk factors of hypothyroidism?What are the symptoms of hypothyroidism?How is hypothyroidism diagnosed?What are the treatments for hypothyroidism?Are there screening tests for hypothyroidism?How can I reduce my risk of hypothyroidism?What questions should I ask my doctor?Where can I get more information about hypothyroidism? Garber JR, Hennessey JV, Liebermann JA 3rd, Morris CM, Talbert RL. Clinical update. Managing the challenges of hypothyroidism. J Fam Pract. 2006;55(6):S1-S8. Hypothyroidism in adults. EBSCO DynaMed Plus website. Available at: http://www.dynamed.com/topics/dmp~AN~T115914/Hypothyroidism-in-adults. Updated July 12, 2016. Accessed February 20, 2017. Vanderpump MP, Tunbridge WM, French JM, et al. The incidence of thyroid disorders in the community: a twenty-year follow-up of the Whickham survey. Clin Endocrinol. 1995;43(1):55-68.